In the world filled with numerous electronic products, one will never worry about the lack of tool for entertainment. A case in point is the hot handset for its mobility and praiseworthy screen, allowing people to play and watch movies on the go rather than in theatre or at home. This is also one of reasons that so many mobiles pop up in the market. But choosing a proper smartphone is truly a bother since no matter iPhone 7/SE/6s, Samsung Galaxy S7/S6 or HTC One X offer people good ways to watch DVD movies as long as you have a right DVD ripper for these handsets. On the other hand, it’s worth mentioning Nokia Lumia 920, the brand new WP8 mobile, seems to be poised for regaining its dominance in handset arena. Armed with a 4.5-inch display touting a resolution of “1280×720”, a dual-core Snapdragon S4 processor and extended battery life, Nokia Lumia 920 provides users better experience on watching movies and videos thereon. However, devoid of DVD drive, Lumia 920, like other smartphones, is still beyond the reach of perfect. As a result, it is not a piece of cake to play DVD movies on Lumia 920 directly. Ever wondered to convert DVD to Nokia Lumia 920 for playback on the move? Itching for a perfect copy of your precious DVD collection and rip to Lumia 920 friendly format for playback either in a long boring trip or at café? Seeking for a Proper DVD Ripper for Nokia Lumia 920? To play DVD movies on Nokia Lumia 920, it's necessary to first know the video format supported. Like Nokia Lumia 820, Lumia 920 is only compatible with such video format as MPEG4, H.264, H.263, WMV, 3GPP and audio formats as MP3, AAC, eAAC, AAC+, eAAC+, WMA, WAV, M4A (Apple lossless), MP4, AMR, 3GP. Now that you make a clear understanding of its specs, now all you need is a proper DVD to Lumia 920 converter to rip and convert DVD to a format that is playable on Lumia 920. Well, MacX DVD Ripper Pro can fulfill your needs and help to rip DVD movies (copy protected DVDs included) to Nokia Lumia 920 H264/MPEG on Mac for playback on the move. What’s more, it also provides you additional bonus such as video editing, cropping, merging, trimming, adding external subtitle( *.srt) to build your own video library while converting DVD movie to Lumia 920. Firstly, you need to download, install and run this DVD to Lumia 920 converter on your Mac. Then, hit "DVD Disc" button to do the DVD source importation. Alternatively, you can import this disc by hitting "DVD Path". After finish loading the DVD, you can go to "Output Profile" drop-down box to pick up a Lumia 920 accepted format as the output, say H264. Alternatively, you can also hit "Nokia Lumia 920 (MPEG4)" as your output format. It's similar to rip DVD to hard drive, USB, hard disc etc. By the way, if you want to edit the video before converting DVD to Lukia 920, you can click edit button in the main interface of the Mac DVD to Lumia 920 ripper to trim off the unwanted part, combine several clips into one file, crop off unwanted black bars of the DVD movie etc. Click bottom-right "RUN" and start to rip and convert DVD to Lumia 920 recognized video. When everything is done, you can transfer ripped DVD videos to Lumia 920 via USB for infinite playback. 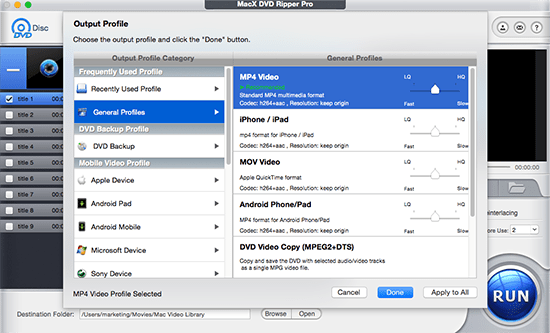 More important, delivering a unique DVD backup feature, this DVD ripper for Mac (Windows version is also available) creates a perfect DVD copy on Mac in a few minutes with video and audio quality the same as original. Besides, the built-in 283 output profiles enable you to rip DVD to Kindle Fire HD, to iPhone Xs, iPad Mini, Samsung Galaxy S9, Acer Iconia Tab, etc with a wink while holding the highest quality. Users who want to play DVD on iPhone iPad etc. are recommended to download MacX MediaTrans that can transfer the DVD movie file to mobile devices in a click for free. In addition, it also gives an easy way to manage (organize, delete and edit etc.) movie file on iPhone iPad and other iOS mobile devices. Notice: We only advocates using this best DVD ripper to rip commercial DVDs to Nokia Lumia under the concept of Fair Use and does not encourage any illegal reproduction or distribution of copyrighted content. Please abide by the local DVD copyright law before doing it.